Nap time. The arch enemy of every toddler. My son, ABC, always tells me that his body isn’t “tired” and he needs to stay awake. Well, nap time was renamed months ago to quiet time. Quiet time is where he has to go to his room and lay on his bed for 30 minutes. Sometimes a little longer, depending on the day we’ve had and the recovery time we needed as parents. Can I get an amen from my other parents out there?! They know what I’m talking about. Wink, wink. Nod, nod. Within the past few weeks or so I’ve been breaking the rules for quiet time. I’ve been letting him skip it… Kind of. I mean, it’s still an option but I give him other choices to choose from. Choices “I can live with.” He doesn’t want to nap and I get that. If I were 4-years-old, I probably wouldn’t want to either. So in came my choices. He can either help me do “x” or do quiet time. Now “x” can be whatever it is you want it to be, as long as it is developmentally appropriate and something that they can do independently. So when I need help with laundry, ABC matches the socks together, or separates everyone’s underwear, and so on. Dishes. He sorts them and puts them in their place, or he dries things that I don’t mind falling on the floor by accident a million times. I always try to find some part of the task that he can do, and at times, add new steps that I can teach him to do. I “teach” when I’m not in a hurry and have the extra time to take my time. Children learn best when everyone is in a good mood and well rested, especially the parent. If you’re already tired and frustrated or just want to “get it done”, skip it and stick to giving them an easy step. Today is food prep day. Most Sundays I prep meals and snacks for the week. Breakfasts, lunches and dinners. We have two boys (1 and 4 years-old) and it is hard sometimes to just get one meal on the table. Food prep is a time saver, and it especially makes a difference when it is done ahead of time for the week. I have to pack 3 lunches every night for the next day and make sure back packs are checked and ready by the door. 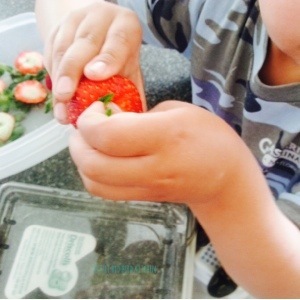 I also try my best to feed my kids healthy snacks. Does it always work? No. But I try. In time, I know they will begin to try new foods when they are ready. 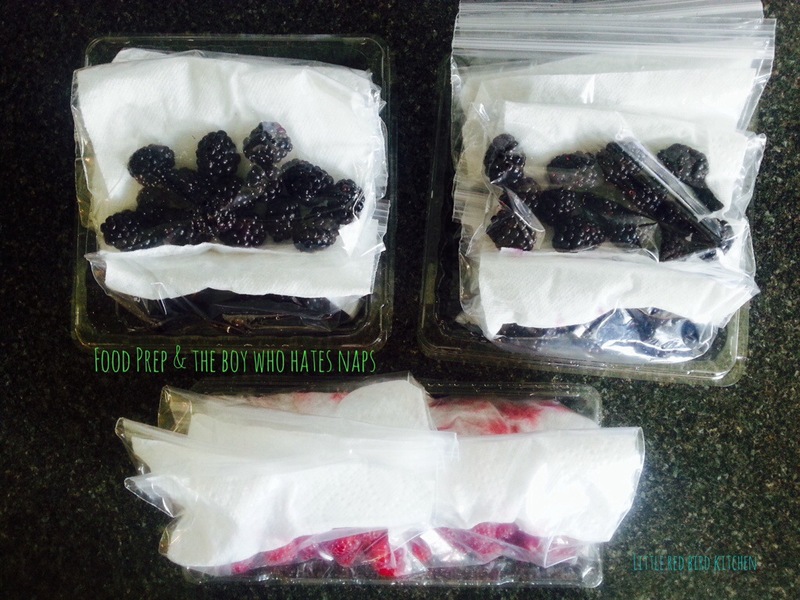 Today, me and my Anti-Napping boy packaged these berries for the week. Break the steps into however you need to for your child. 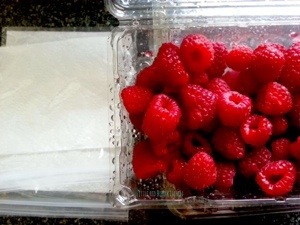 I handed ABC his own container of berries, bags and paper towels. I showed him the order and he was able to complete all the steps by himself. 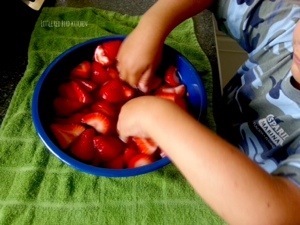 Some kids may only be able to put a few berries in the bag, some may only be able to put the berry filled bags in the container. As long as they are “helping”, it makes for a great thing to do together. You might as well get some work out of them, right? Interesting. I’m not a fan of the nap. Actually I’m not a fan of making kids do anything they do not want to do. (Then again, I’m not a parent, so perhaps that will change at some point.) I like this though. I believe when you get down to the root, one of the points of a “nap” or “quiet time” is to help young people develop a routine, because let’s face it, life is for the most part a series of routines. I think what you’re doing though also accomplishes that task. It’s also relaxing for the kid, or so it would seem, so in essence the “time to rest” element is also included. Very fun. For the record, I think you would make an excellent narrator/voice-over actress. Everything I read from you I read in your voice. That’s the first sign of good narrator/vo person.